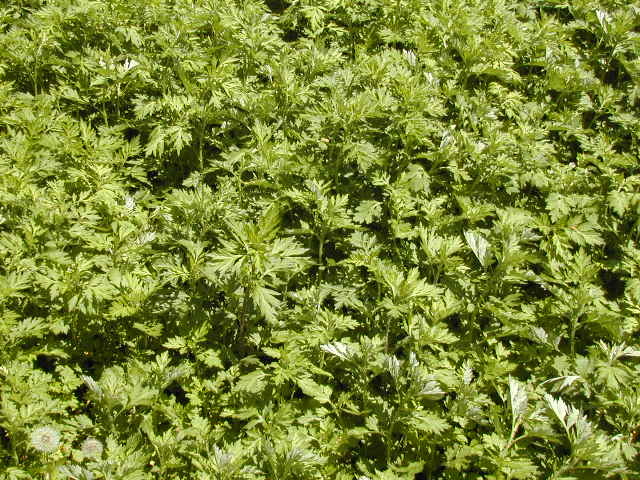 MUGWORT, (Artemisia vulgaris) is a shrubby perennial that is native to North America where it grows easily in any type of soil, in sun or shade and is drought tolerant. A medicinal herb our ancient ancestors called the ‘woman’s herb’ to stimulate the uterus during the birthing process and to reduce uncomfortable symptoms during menstrual cramping and menopause. NOTE: Not to be ingested during pregnancy, while breast feeding or when taking any type of blood thinners. Mugwort has long been seen as a sacred herb of protection; placed over doorways, added to sage and cedar blend for burning during a ceremony and in the Chinese tradition of Feng Shui, its leaves were sprinkled around the house for protection. During the flu season or any other viral outbreak I eat a tiny dime-sized leaf each day until I feel the threat of sickness is over. In your garden place it where you can touch the leaves and rub a bit of its essence on your arms and legs. Add some dried leaves to a dream pillow to calm your mind and emotions. Make a strong tea to make a powerful addition to your bath. Add dried crushed leaves to your bath salts. Mugwort likes to grow alone, adding ingredients to the soil to keep other plants from growing easily nearby. It makes an excellent container plant. Reflection is about seeing with the inner eye and feeling with the inner sensory systems. The experience can take you into a genre of peace that is beyond the intellect. It begins a small retreat into solitude that gives meaning to your life and develops a beneficial relationship with the earth. Water is especially helpful in your garden as it encourages a sensory conversation with an emotional impact. Reflections on the water’s surface have the power to pull your attention inward, allowing your attention to be pulled away from the stressful thoughts of the day. Black water creates the clearest reflection giving the appearance of depth that is felt rather than seen. Deep water in the discipline of feng shui symbolizes wisdom and abundance. As light creates a mirror on the water’s surface, wind gives movement to a kaleidoscope of images. Your attention is captured by the pure joy of the moment. Your garden’s wholeness and harmony are sensed, felt and realized. It is a good time to ask for insight into a situation in your life or the perfect location for a new plant you recently purchased. Place the reflective water treatment to receive wind, sunlight, moonlight, and shadows. Install in a quiet, secluded area of the garden. Frame it with lush growth, plenty of leaves that can capture the wind and create gently moving images in the water. Create a comfortable seating space that allows gazing into the water. I use a bird bath, filled daily with fresh water that my husband and I can see from our breakfast table. 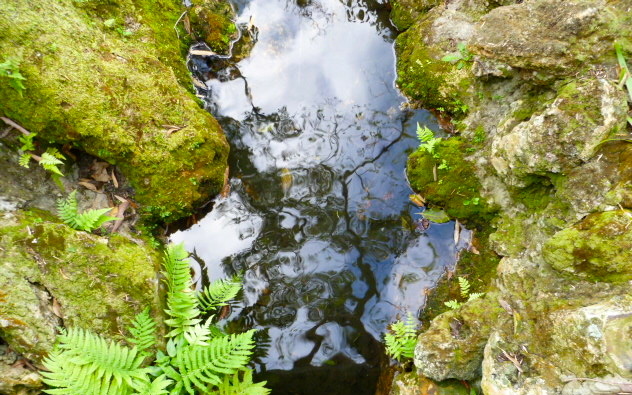 In a Japanese garden, a large stone carefully placed in the water symbolizes the presence of a sacred mountain. Although a very simple water treatment, a large pot filled to the brim with water offers romance and elegance. As it reflects the movement of tree leaves, the light from the sun or moon offer pleasure to the senses. Place to reflect roses for romance, a passion flower vine for developing faith or California Fuchsia, Zauschneria californica for healing repressed emotions. The Energizer Breath is a simple technique that can easily become a healing morning ritual. It begins the day with positive thoughts and images that can trigger harmonious and peaceful emotions. Deep breathing can slow the mind allowing the heart to open by the beauty and stillness of your garden. But, the best result, is receiving insights about your garden. I think of the most unusual ways to change the garden, perhaps a new plant to add or moving a plant that isn’t doing very well to a location I hadn’t yet tried. My intuition reminds me to notice a new blossom or find a bird nest. I first learned this process in 1981 from a powerful Kahuna, Morrnah Simeona. Then, we were advised to do it in the beginning of the day and in the evening before going to sleep. I have been using it most every day since. I have found it very helpful to revitalize, calm, or just go to sleep when I want. Breathing has to do with the element of air that offers a space for movement of the wind, small fragrant breezes and butterflies. Choose a favorite place to sit where you can watch the sunrise or just take time to think about your garden. What does it need to attract butterflies? Any changes? This process is simple the results are worth the time. Inhale a slow, deep breath to the count of 7. Be aware that you are breathing into your body energies that are in the air around your garden. It’s fun to focus on breathing the energies of the sunrise, a favorite tree, a butterfly, or a beautiful flower. Gently hold that breath for the same count of 7. Feel the energies of the breath expand into your body. As you allow the body to rest with the breath, your metabolism can slow. Now, let the breath go for the count of 7. 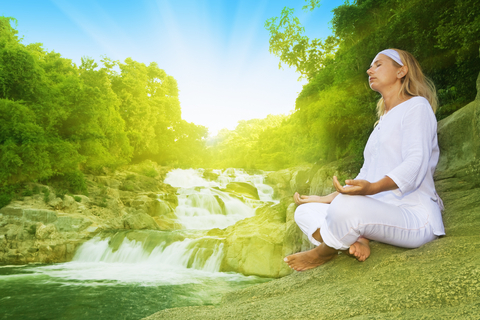 Release toxins, mental or emotional blocks, or any worries. Again rest your body for the count of 7; do not inhale or exhale. Be at rest between the breaths. Imagine or feel yourself in the center of the Sun. Be filled with the energies of love or a specific color. REPEAT 6 more times with an attitude of gratitude. On each round you might enjoy focusing on a different location or aspect of your garden. Ask for specific insight.